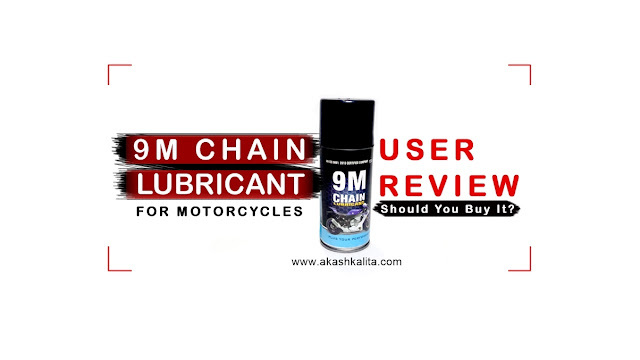 Akash Kalita: 9M Chain Lubricant: Should You Buy It? Having a properly lubricated chain is important for optimum performance of a motorcycle. A dry, non-lubricated chain not only provides retarded performance but also damages the sprocket. A non-lubricated chain produces clunky sound and also might break or come off the sprocket in certain cases. To avoid all these a motorcycle's chain must be well lubricated. But there are a wide range of lubricants from well known brands to local products. So, how good are not so famous motorcycle Chain Lubes? I recently had to buy a new chain lube for my motorcycle as the can of Rolon Motorcycle Chain Lubricant that I was using had no product left inside it. While browsing through various products in the market here in Guwahati, Assam, India I came across a product called '9M Chain Lubricant'. The product was unknown to me and I did not find it online either. I was a bit skeptical about using the product as it was unknown to me and also it rhymes with a very well known brand too which states the obvious. But I thought of giving it a shot and bought it. The MRP on the product was INR 175 for a 150 ml spray can. I applied the product to the chain of my motorcycle by spraying a layer over it and allowed it to settle for 10 minutes. After the lubrication when I rode the motorcycle the difference was significant as the motorcycle immediately felt smoother. The interval of time between two lubrication was observed to be approximately 500 km in dry conditions. For muddy and wet roads the interval might be shorter. After using the product personally, it is safe to conclude that although the 9M Chain Lubricant is an unknown or not so popular product it definitely works and serves the purpose that it is supposed to.